When I reflect on the Tour De Yorkshire, I can only describe my overall experience as mega, incredible or insane. As one of my main targets for the year, I had set TDY as a personal goal and wanted to get selected for the team. Apart from “The Tour of Britain,” TDY is the biggest UK stage race which a UCI continental team can enter so to be picked was a big deal for me and provided me with an opportunity which could not be missed. Stage One started in Bridlington and finished 174km away in Scarborough. 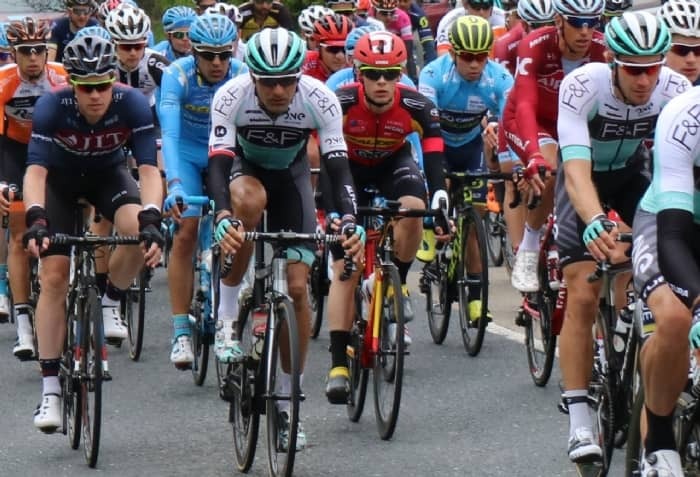 It was not a direct route and included 3 categorised climbs – incorporating Cote du Robin Hood’s Bay which was a deciding feature in the 2016 edition. The breakaway escaped after 20km of frantic riding and held a gap of around 3 minutes for most of the day. The gap held steady and, surprisingly, the hills were controlled and ridden tempo. The real racing kicked off on the descent into Whitby and by Robin Hood’s Bay when the World Tour guys started to test their legs. The stage finished with Groenwegen of Lotto Jumbo taking the win and Enrique Sanz, Raleigh GAC, finishing 10th. The racing was unlike anything I have ever experienced. The neutral zone was controlled with riders jostling for position eager for the breakaway. Following the sign signalling kilometre zero, persistent attacks from the peloton lasted for around 20km until a group finally got away. When the World Tour teams were happy with the group, there were signals from the front indicating it was away and the race speed slowed dramatically – it was reminiscent of a steady café ride! I even had time for a “comfort break” along with around 2/3rds of the bunch! I knew however that later on, the race pace was going to change. Prior to the race start, I was full of excitement and nerves. I had been given a job to do by DS, Cherie Pridham which was to help Sanz and Mora where possible with bottles, food, clothing etc. I felt like a domestique who did not ride on the front! I carried out my role weaving in and out of the bunch returning to the car for bottles and depositing clothing on a number of occasions. As we raced through Whitby heading towards Robin Hood’s Bay, it was at that point I began to feel the bite in my legs and when we got to the climb, my day was done. I tried hard to rejoin the race on the descent working with a rider from Cofidis and One Pro Cycling. We came very close but we didn’t have the firepower to make up the gap and began the cruise home to Scarborough where the finishing line awaited. As I crossed the line, I had just completed my first race at this level and tasted my first experience of crowds of such magnitude. It’s hugely addictive. During Stage 1, I learned a lot about myself and about the next level of racing. It is very different to what I am used to, there is a large amount of respect within the peloton because everybody on the start line had a job to do and the riders acknowledge each other’s work. I also found that positioning within the bunch is crucial within these race’s which was my issue on the final climb of the day. I understand more about how a race convoy works now having had plenty of opportunities to go back to the team car for bottles and clothing. Stage 2 & 3 will be uploaded shortly, keep an eye out for them!